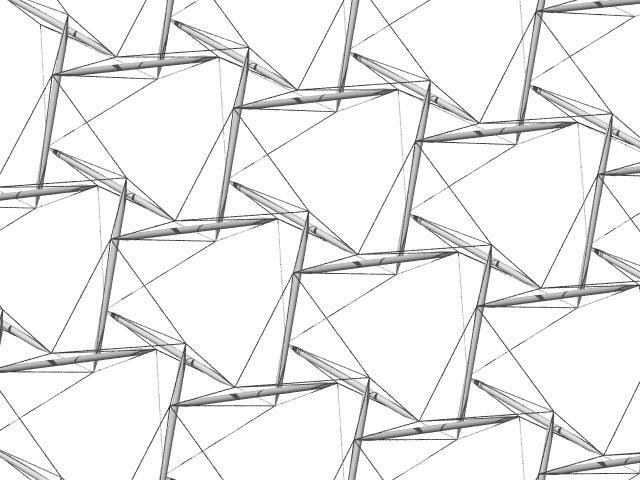 A technology based on tensegrity techniques is proposed for the economical construction of tough, rigid, large-scale domes. Sample structures, possible applications, related technologies and plans for future research are also presented. The technology is of the double-layer type where an outer and an inner layer of tendons are inter-connected by struts and additional tendons. Struts and tendons are organized to emphasize triangulation and lateral transmission of exogenous loads within the space frame. It is hypothesized, and preliminary testing has verified, that this arrangement will result in a structure with improved stiffness. If more thorough testing verifies this hypothesis is correct, this technology will overcome a shortcoming which plagues tensegrity designs, while retaining the ethereality and resilience which recommends these designs. The development of a structural technology to economically encompass large areas would be useful for warehouses, permanent or temporary protection for archaeological and other vulnerable sites, large-scale electrical or electromagnetic shielding and exclusion or containment of flying animals or other objects. Over cities, structures based on such a technology could serve as frameworks in which environmental control, energy transformation and food production facilities could be embedded. The technology discussed in this prospectus is aimed at facilitating the economical construction of tough, rigid, large-scale domes. The technology is based on the tensegrity approach to space frame design which strictly segregates compressive and tensile forces among the members of the frame. This minimizes the number of members which need to sustain compressive forces. The minimization of these more massive and visually intrusive components results in most frame members being lighter-weight more-transparent tensile components. This is not to say that there have been no practical structures built using the tensegrity principal. Effective use of tensegrity principles has been made by Geiger and Levy to design roofs which cover large areas. [Campbell94 reviews these approaches.] However these approaches result in essentially composite structures where a substantial portion of the structure is fabricated using non-tensegrity technologies. Thus these structures do not take complete advantage of what the tensegrity technique has to offer. Structures based on the technology proposed here maximally employ tensegrity principles. 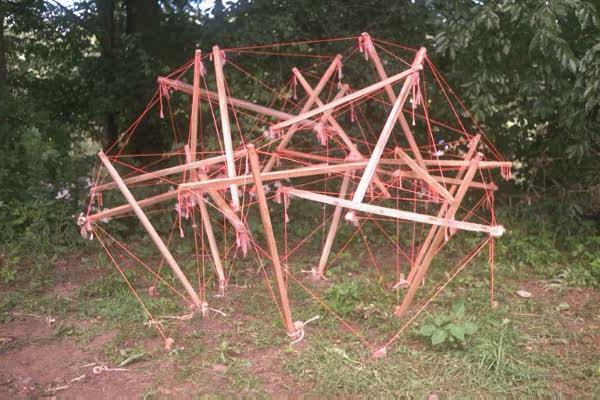 Tensegrity methods derive maximal structural performance from the materials employed. This is due to their maximization of the tensile components of the structure which allows them to take full advantage of the progress has been made in deriving larger tensile strengths from materials. [See Davis70 pp. 2-3 for data on metals, and Jang94 for the huge tensile strengths obtained from fibers of various materials.] The resulting light weight allows tensegrity structures to encompass very large areas with minimal support at their perimeters, obviating the "heavy anchorage devices"[Motro87, p. 43] needed for support with some cable-based technologies, or extensive support structures needed by the composite structures discussed above. This prospectus focuses on the construction of tensegrity domes since these are most useful in a terrestrial context. However, since the technology proposed conceives domes as truncated spheres, the technology can easily be applied to the design of spheres as well. One characteristic of materials research has been the increasing tensile performance which researchers have been able to extract from materials through various fabrication technologies. In the construction sector, this performance can be harnessed by structural technologies which rely predominantly on tensile components. Tensegrity designs represent such a technology. Inadequate design tools - lack of design and analysis techniques for these structures has been a hindrance. Mathematical programming techniques and other algorithms have been implemented in computer software to compute member lengths, clearances between members, relative prestress forces, effects of exogenous loads and perform other analyses. In this context, a general method for formulating the mathematical programming problem was developed which provides maximal design flexibility. This flexibility has allowed, among other things, the design of approximately spherical structures where all the struts have equal lengths. A method for organizing tensegrity trusses into spheres has been developed. The method is based on the geodesic subdivisioning[Kenner76, Chapter 5] of an octahedron. The triangular faces of the octahedron are subdivided into smaller triangles using a grid generated by subdividing the edges of the octahedron. The number of subdivisions for an edge is called the frequency of a particular subdivisioning. Frequency is also referred to by the Greek letter 'ν' (nu). Hence, a truss based on an octahedron whose edges are subdivided into 10 segments would be referred to as a 10ν octahedral truss. When the average length of the members remains constant, greater frequency means more members and hence a larger structure, linear dimensions increasing proportionally to the frequency. A method for truncating spheres to obtain domes has been developed. In turn, methods have been developed to truncate domes to obtain half shells and larger openings in the dome. Assembly procedures have been developed which will be suitable for commercial-scale structures. Small-scale spherical models have been assembled to test computed values for unloaded member lengths and examine behaviors of the structures. 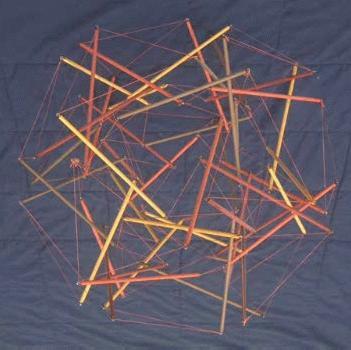 A photograph of a model of a sphere assembled using the proposed double-layer tensegrity technology is shown in Figure Oct4v. Two spherical models have been assembled to test potential commercial realizations of these structures. They used metal components instead of the simpler models' dowels and fishing line. A photograph of one of these models is shown in Figure Oct2v. Two larger-scale dome models composed of wooden stakes and nylon twine have been constructed to test the proposed methodology for dome design and investigate fabrication techniques. A photograph of the 4ν model which uses 3-foot struts is shown in Figure Oct4vd. A photograph of the 8ν model which uses 4-foot struts is shown in Figure Oct8vd. Techniques have been developed for representing these structures schematically in a systematic and intelligible way. A preliminary analysis has been done of the response of these structures to concentrated loads. Software has been developed to automatically generate description files for very-large-frequency versions of these structures. The starting point of Tensegrity Solutions' system for designing a tensegrity truss is the tensegrity tripod[Burkhardt04] and tensegrity networks derived from geodesic polyhedra. [Pugh76, pp. 28-30] A tensegrity tripod encompasses six tendons. Three tendons, referred to here as "apex" tendons, bind the three struts together at one end to form a triangle which represents the apex of the tripod. Each of the other three tendons, referred to here as "interlayer" tendons, connects the apex end of one strut to the the non-apex end of an adjacent strut in the tripod. This forms an additional three triangles, each triangle containing an apex tendon, an interlayer tendon and a strut. 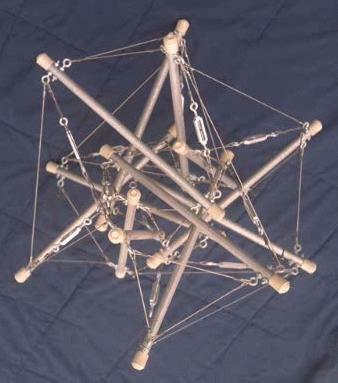 Figure Tripod shows a tripod; Figure Oct6vnet shows a tensegrity network based on a 6ν subdivisioning of an octahedron, and Figure Oct6vtri shows a spherical assembly of tripods embedded in the tensegrity network. To enhance diagrammatical clarity, the back halves of Figures Oct6vnet and Oct6vtri have been sliced away. A dome can be induced by truncating the sphere. Figure Tripods shows what the complete truss looks like in a planar context. The truss looks the same regardless of which side of the plane it is being viewed from. This apparently planar section of truss can also be conceived as a small section of the surface of a very large double-layer sphere. In this context, the small section looks the same regardless of whether it is being viewed from inside or outside the sphere. In the spherical context, the limitation to networks of alternating triangles essentially eliminates all but the octahedron as possible bases for a network. Figure Oct10vnt diagrams a 10ν version of such a network as it appears when projected onto a sphere. This has its disadvantages since the octahedron has a much more faceted look to it than the icosahedron. An icosahedron would be the preferred basis if it were feasible. This means adjustments must be made in the shape finding procedure so a spherical looking result is obtained. An octahedral basis also yields a lot of member activity at the vertexes which must be resolved. Tensegrity Solutions has developed design methodologies which effectively solve both these problems. The phrase "Coordinate values" appearing under "minimize" indicates that the coordinate values are the control variables of the minimization problem. These are the values which are changed (in accordance with the constraints) to find a minimum value for obj. lm stands for the length of member m, and wm is the constant weight on the second power of lm in the objective function. wm is negative if member m is a strut, positive otherwise. These weights provide maximum control over the characteristics of the resulting solution. Just about any feasible tensegrity configuration can be reached by choosing the members to include in the objective function and their weights appropriately. In the member constraints, lbarn is a positive constant value. "-" precedes (ln)2 and (lbarn)2 if member n is a strut and "+" precedes them if member n is a tendon. In the other constraints, sk(···) and dq(···) are (most likely linear) functions of the coordinate values. Tensegrity Solutions has developed exact and penalty methods for solving this problem. The technique for the exact method is based on ideas in Luenberger's book[Luenberger73] and some matrix techniques. The penalty method is implemented as described in Luenberger[Luenberger73, pp. 278-280]. The penalty method is especially advantageous in initial iterations since it doesn't require the constraints to be exactly met. The exact method yields more precise results and can be used to fine tune a result. In both cases, the design software allows the solution to be derived using either the PARTAN method[Luenberger73, pp. 184-186] or the Fletcher-Reeves method[Luenberger73, p. 182] in conjunction with a custom line-search technique. A corollary to this research showed that the relative prestress forces in a structure's members (also known as "self-stress") can be computed from the Lagrange multipliers of the resulting solution instead of going through the more standard procedure of solving the matrix of force vectors. To analyze the effects of exogenous loads on a structure's members, a different conceptual framework is used. For this purpose, a structure is viewed as a flexibly-jointed set of elastic and fixed-length members, the tendons being the elastic members, and the struts being the fixed-length members. The solution of the mathematical programming problem outlined above and the accompanying prestress forces provide a valid initial solution for the equations developed to compute the effects of exogenous loads. The vectors representing the exogenous load are then introduced, and the equation system is solved using Newton techniques to arrive at values for the resultant member forces. 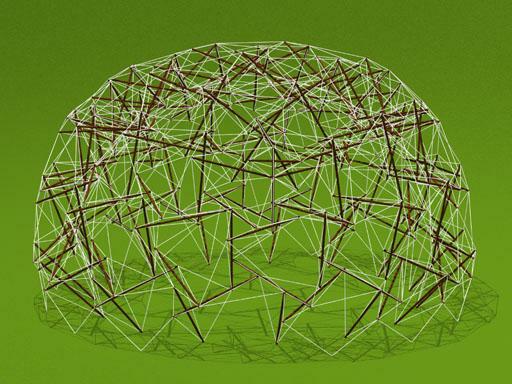 A representation of a dome which utilitizes Tensegrity Solutions' technology appears in Figure Oct10vd. A photograph of a lower-frequency dome which has actually been built is shown in Figure Oct8vd. It is composed of 102 one-inch by one-inch by four-foot (25.4 mm by 25.4 mm by 1.22 m) hardwood stakes and 570 nylon-twine tendons of various lengths. A photograph of a very-low-frequency dome is shown in Figure Oct4vd. It is composed of 27 one-inch by one-inch by three-foot (25.4 mm by 25.4 mm by 0.91 m) hardwood stakes and 174 nylon-twine tendons of various lengths. At this low frequency, the interior space is fairly minimal in comparison with the volume of the dome as a whole. This model was constructed mainly to test software predictions and develop assembly procedures. Superstructures for embedded substructures allowing the substructures to escape terrestrial confines where this is useful (e.g. in congested or dangerous areas, urban areas, flood plains or irregular, delicate or rugged terrains). Economic large-scale protection of storage, archaeological, agricultural, construction or other sites. Frames over cities for environmental control, energy transformation and food production. Large-scale electrical or electromagnetic shielding. Exclusion or containment of flying animals or other objects. Spherical superstructures for space stations. Low-environmental-impact shells for musical performances. Indoor/outdoor pavilions for trade shows etc. Supports to hold sunscreen protection for vulnerable amphibians. Watersheds to keep rain water from percolating through contaminated soils into groundwater, perhaps temporarily during in-situ remediation. Frames for hanging plants or other objects to dry. Pergola, trellis, or topiary framework. Micro-meteorite protection, sun-shielding for Martian colonies. The first category contains space frame technologies where the members are very homogeneous. They are typically realized as planar trusses perhaps connected at an angle with other planar trusses. Biosphere 2[Kelly92, p. 90] is an example. Their faceted shape means they contain less space per unit of material than a spherical structure built with the same amount of material. Makowski's book[Makowski65] contains a variety of examples. The second category contains those technologies which are typified by geodesic domes[Fuller73, pp. 182-230] and Kiewitt domes. 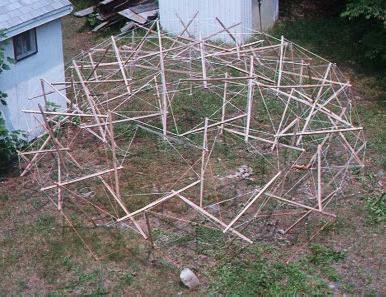 [Makowski65] Geodesic domes share many qualities of tensegrity domes. The primary difference of these from tensegrity technologies is the requirement of these technologies that all components be able to sustain both tensile and compressive forces. Related tensegrity technologies (RTTs) can be divided into five categories. They are ordered with the technologies which have yielded more practical structures toward the beginning. Technologies typified by the circus tent represent a sort of tensegrity approach. Here a tensile network (the tent fabric) is supported at various locations by large poles. Anchors and supporting cables usually play a role. The compressive elements are few and massive. This technique has resulted in a variety of practical structures. For examples, see Otto73 and Otto82. Pneumatic technologies, where a large fabric structure is supported by internal pressurization, are also tensegrity technologies. In this case the internally compressed air molecules serve as the compression members, and the structure's skin serves as the tension members. This technique has also resulted in a variety of practical structures. For examples, see Otto82. The technologies embodied by the "Cabledome" of Geiger and the "spatially triangulated" approach of Levy have been utilized by architects to develop practical roof coverings for functional buildings, Campbell94 reviews these technologies in detail. These technologies are basically a technique for designing large-scale rim-supported circular roofs. Cables at the perimeter suspend a smaller circle of vertical posts which in turn provides a perimeter for supporting a yet smaller circle of vertical posts and so on until the center of the roof, the smallest circle of the series, is reached. Oren Vilnay[Vilnay90] has developed a theoretical technology for tensegrity design whose symmetries are similar to those of #3. In his single-layer technology, the struts extend between perimeters instead of being vertically suspended within a perimeter as in the previous technology. Emmerich, Hanaor and Motro[Emmerich88, Hanaor87, Motro87, Hanaor92, Motro92] have developed a method for fabricating trusses from tensegrity prisms. This technology is similar to the one proposed here, but differs in details which may be structurally significant. For the most part, the resulting network for the outer and inner layers of these structures is identical with the dome proposed here. However, the way the struts and tendons are connected between the layers is different. Research has concentrated on the examination of planar trusses and hasn't as yet dealt concretely with the design of spheres or domes. Hanaor has also done significant work developing an algorithm for computing member lengths in tensegrity designs. That procedure is based on the methodology in Argyris72. Pellegrino86 has an alternative methodology for computing member prestress forces. The separation of members into purely tensioned components and purely compressed ones means the purely tensioned members can be as light weight as current material technology allows. The predominance of light-weight tendons in the designs allows the structure to be less visually intrusive, lighter and probably more economical. It is hypothesized that the well-triangulated design of the technology described in this prospectus will yield a stiff structure with superior performance characteristics. As noted in Section 2.1, lack of stiffness and lack of resistance to concentrated loads is one of the notable problems with tensegrity structures in general. A comprehensive comparison of the proposed technology with the other technologies, particularly RTT #5, needs to be carried further. Preliminary tests have shown the proposed technology resists concentrated loads much more effectively as frequency increases and will thus be suitable for commercial-scale applications where RTT #5 would not. The resistance to concentrated loads certainly differentiates this technology from RTT #1 and #2. Since the topology of the structures proposed here is based on truncated spheres, entire structures with roofs and side walls can be fabricated. This overcomes a major shortcoming RTT #3 which basically can only provide a structure for a roof and requires an existing structure based on another technology to support the roof. This shortcoming makes RTT #3 unsuitable for many of the applications discussed in Section 3. It is also an advantage over RTT #5 as currently proposed although Tensegrity Solutions' dome fabrication technology can easily be extended to give RTT #5 the same capability. Preliminary investigations have shown that having 12 tendons securing each strut, and having the structure supported by a large number of independent struts means the failure of one of them has very little impact on the structure. None of the other RTTs exhibit this degree of redundancy. All of them have members whose failure would be expected to have a major impact on the shape of the structure they are embedded in. The technology proposed here allows for the dome to have a planar, circular foundation with evenly spaced footings. This could simplify construction in many situations and give an aesthetically pleasing appearance. This is an advantage over RTT #5. The fact that the structure requires foundation footings only where the base struts meet the ground means a minimal foundation is required. This is an advantage over RTT #3 which is basically only a technology for a flat roof and requires a substantial additional non-tensegrity perimeter structure to support it. The assembly process for the structure is such that the higher-tension tendons are fairly slack when installed and are brought to full tension when high-leverage tendons of lower tension are installed. This eases the construction process. The tripods are fabricated individually first and form a natural and compact "atom" for this construction process. This is an advantage over RTT #3 and #4. 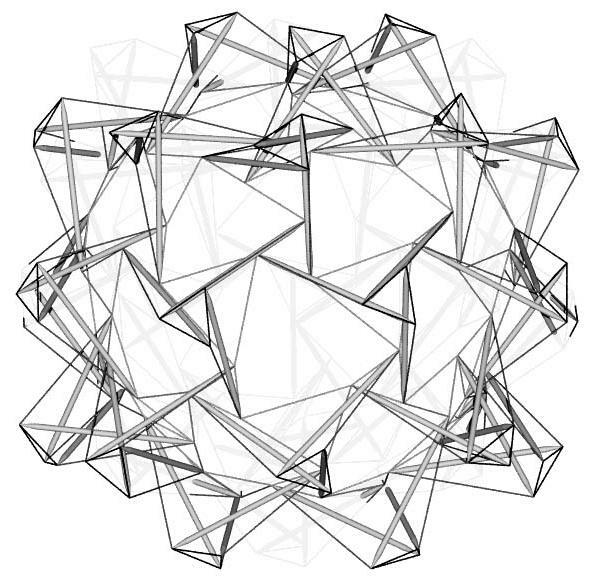 As stated in Section 2.2, Tensegrity Solutions' tensegrity design software allows structures to be designed where all the struts have identical lengths and can thereby all have identical design. This substantially eases fabrication for these substantial components. The tendons have a variety of lengths. However this is not a problem since there is not a great loss of mass production advantage in having to cut cable (or whatever linear material is being used to fabricate the tendons) to various lengths. This is an advantage over RTT #4. It is anticipated that future investigations will show that this identical strut length feature creates no disadvantage as far as exogenous load handling, more particularly that the structure shares the usual characteristic of an effective tensegrity design that loads are transmitted away from concentrations. Tensegrity Solutions' most fundamental need is for the development or location of a concrete design problem where the proposed technology can be applied to enough advantage that it would be adopted. Another focus of future research will be to utilize the software tools developed by Tensegrity Solutions to analyze the load-bearing capabilities of domes designed using Tensegrity Solutions' and alternative technologies. Of particular interest is how these capabilities change with the frequency of a dome. For the technology to be useful, it must exhibit desirable characteristics at very large scales. To carry out this research, Tensegrity Solutions' computing facilities need to be upgraded, and the software needs to be enhanced as well. A machine able to accommodate C++ software, supply abundant random-access memory and advanced floating-point capability is needed. Current plans are to acquire hardware based on the Alpha chip with Linux and/or Windows NT-based software. Another critical need is for outside consultants to assist in the details of the design of tensegrity solutions and comment on the analysis techniques used by Tensegrity Solutions. Tensegrity Solutions' primary expertise is theoretical. Outside consultants are needed to identify appropriate ways of realizing the foundation, joinery and surfacing of a solution. In addition, they can suggest ways in which Tensegrity Solutions' procedures can be better brought into line with standard architectural and structural engineering practices. Tensegrity Solutions is a spin off of Software Services which provides computer-related instruction and application software design and coding services and has provided computer support for the research activities outlined in this prospectus. These activities in turn have provided Software Services with a laboratory for testing various approaches to software design and as a test bed for various optimization products. Robert Burkhardt is the principal of Tensegrity Solutions. He received a B.A. in economics from the University of California at Irvine in 1975 and attended graduate school in economics for five years at the Massachusetts Institute of Technology. His fields of concentration at MIT were monetary economics and econometrics. The background in optimization and mathematical programming received at MIT is responsible for much of his approach to tensegrity design. He has taught computer science courses at Boston University and the Lowell Institute School (Computer Graphics, C Programming, C++ Programming, X Window Programming, BASIC). He has fulfilled contracts for software design and implementation for Computervision Corporation (interactive graphics metafile display) and Carvajal, S.A. (software to create, update, maintain and process data for a Spanish-language dictionary). He worked as a software engineer for Gamesville.com for three years. Argyris, J. H. and D. W. Scharpf, "Large Deflection Analysis of Prestressed Networks", Journal of the Structural Division, American Society of Civil Engineers, Vol. 98 (ST3), pp. 633-654 (1972). Burkhardt, R. W., A Practical Guide to Tensegrity Design (2nd edition), Cambridge, Massachusetts: Tensegrity Solutions, 2004. Campbell, David M. et al., "Effects of Spatial Triangulation on the Behavior of `Tensegrity' Domes," in John F. Abel et al., ed., Spatial, Lattice and Tension Structures: Proceedings of the IASS-ASCE International Symposium 1994, American Society of Civil Engineers, 1994. Davis, LeRoy and Samuel Bradstreet, Metal and Ceramic Matrix Composites, Boston: Cahners Publ. Co., Inc., c1970. Emmerich, David Georges, Structures Tendues et Autotendantes, Paris, France: Ecole d'Architecture de Paris la Villette, 1988. Fuller, R. B., Synergetics2: Further Explorations in the Geometry of Thinking, New York: MacMillan Publishing Co., Inc., 1979. Fuller, R. B., Synergetics: Explorations in the Geometry of Thinking, New York: MacMillan Publishing Co., Inc., 1975. Fuller, R. B. and R. Marks, The Dymaxion World of Buckminster Fuller, Garden City, New York: Anchor Books, 1973. Hanaor, Ariel, "Tensegrity: Theory and Application," Chapter 13 (pp. 385-408) in J. François Gabriel, Beyond the Cube: The Architecture of Space Frames and Polyhedra, New York: John Wiley & Sons, Inc., 1997. Hanaor, A., "Aspects of Design of Double-Layer Tensegrity Domes," International Journal of Space Structures, Vol. 7, pp. 101-113 (1992). Hanaor, A., "Preliminary Investigation of Double-Layer Tensegrities," in H.V. Topping, ed., Proceedings of International Conference on the Design and Construction of Non-conventional Structures (Vol. 2), Edinburgh, Scotland: Civil-Comp Press, 1987. Jang, Bor Z., Advanced polymer composites, Materials Park, Ohio: ASM International, 1994. Kelly, K., "Biosphere 2 at One," Whole Earth Review, Winter 1992, pp. 90-105. Kenner, H., Geodesic Math and How to Use It, Berkeley, California: University of California Press, 1976. Luenberger, D. G., Introduction to Linear and Nonlinear Programming, Reading, Massachusetts: Addison-Wesley Publishing Co., 1973. Makowski, Z.S., Steel Space Structures, London: Michael Joseph Ltd, 1965. Motro, René et al., "Form Finding Numerical Methods for Tensegrity Systems", in John F. Abel et al., ed., Spatial, Lattice and Tension Structures: Proceedings of the IASS-ASCE International Symposium 1994, American Society of Civil Engineers, 1994. Motro, R., "Tensegrity Systems: The State of the Art," International Journal of Space Structures, Vol. 7, pp. 75-84 (1992). Motro, R., "Tensegrity Systems for Double-Layer Space Structures," in H.V. Topping, ed., Proceedings of International Conference on the Design and Construction of Non-conventional Structures (Vol. 2), Edinburgh, Scotland: Civil-Comp Press, 1987. Otto, Frei, ed., Tensile structures; design, structure, and calculation of buildings of cables, nets, and membranes, Cambridge, Massachusetts: MIT Press, 1973. Otto, Frei, Natürliche Konstruktionen, Stuttgart: Deutsche Verlags-Anstalt, 1982. Pellegrino, S. and C. R. Calladine, "Matrix Analysis of Statically and Kinematically Indeterminate Frameworks", International Journal of Solids and Structures, Vol. 22, No. 4, pp. 409-428 (1986). Hugh, A., An Introduction to Tensegrity, Berkeley, California: University of California Press, 1976. Saka, T. and Y. Taniguchi, "Damage to Spatial Structures by the 1995 Hyoguken-Nanbu Earthquake in Japan," International Journal of Space Structures, Vol. 12, Nos. 3&4, pp. 125-147 (1997). Vilnay, Oren, Cable Nets and Tensegric Shells: Analysis and Design Applications, New York: Ellis Horwood, 1990. The following comments were received when an initial version of this prospectus was sent in response to a solicitation by the National Science Foundation's Small Business Innovation Research Program. Further research on the static's and dynamics of "tensegrity" systems is needed because such systems are being widely used for longer spans. The P. I. does not appear to have the expertise to perform an engineering evaluation of "tensegrities". However he has thought about their geometry and may have developed innovative forms. He is encouraged to team-up with a structural engineering firm (there are many notable ones in the Boston/Cambridge area) and resubmit an SBIR proposal. The scientific/engineering/educational significance of the proposed research. The proposal relates to the design space frameworks constructed from axially loaded members. The so called tensegrity structures are one type. The research would improve a design scheme assembled by the PI. The soundness of the research plan to establish the probable technical and commercial feasibility. Based on the work of others, software has been written to design/analyze tensegrity space frames. The plan is to upgrade this software and validate it. Small dowel and fishing line models would be tested. The uniqueness/ingenuity of the proposed concept or application as technological innovation. The uniqueness here has to do with some aspects of the software developed by the PI. The potential of the proposed concept for significant commercial applications. Marketing the software could be a commercial application. Further, the likelihood of designers considering the use of tensegrity space frames would be enhanced if the PI published his work. The educational and professional experience of the Principal Investigator, other key staff, and consultants in relation to the proposed research; the time commitment of the Principal Investigator (NSF requires a minimum of one month); and the availability of instrumentation and facilities. The PI has programming background but no engineering training. One would tend to question his ability to make informed structural design judgements. Software Services is a one person firm so design assistance is unavailable. Small dowel and fishing line models would be tested. I concur that "tensegrity" systems have the potential of making longer spans feasible. Tasks 4, 4A and 5 are not well defined. The proposed "double layer dome system" appears innovative, different from the Geiger/Levy systems. A thorough study of the PI's system in collaboration with a structural engineering firm would clarify its potential. The P.I. should team up with a structural engineering firm. It's unclear whether the P.I. understands prestressing and the different types of trusses that are denoted as "tension". The objective of the proposal is to theoretically and experimentally evaluate a new space frame technology. The research approach is poor and practically non-existent. The research proposal looks at computer modelling, with very poor technical and structural approach. The concept has no potential for commercial applications. The PI has expertise in economics and computer programming. No background in structures. See also the Synergetics Gallery.